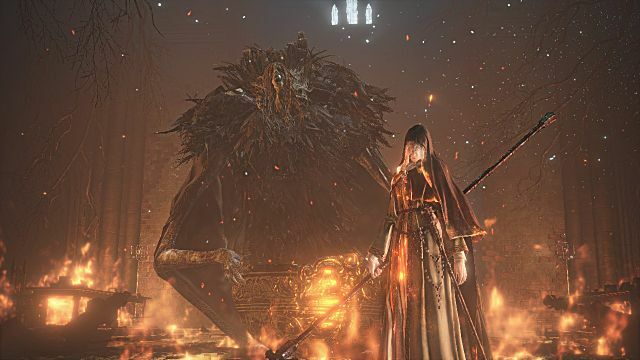 Dark Souls 3's first DLC, Ashes of Ariandel, comes with a bundle of new weapons, armors, and spells to play with. 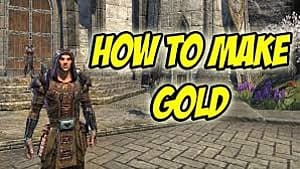 There is more equipment in store here than any DLC for Dark Souls games of old has ever offered -- and we're here to guide you through how to find them all. We've even included screenshots for your convenience. Half-baked directions giving you conniptions? 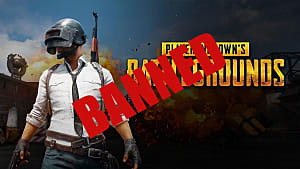 Can't locate that final, missing weapon? Well, Champion of Ash, you've certainly stumbled into the right place. Fret not, fret not -- the loot is all but yours now. With our screenshot guide to Dark Souls 3 in hand, you'll learn exactly how to find all of the new weapons, armor, and spells introduced in Ashes of Ariandel. Ashes of Ariandel introduced a whopping 13 weapons, 2 shields, and a pyromancy flame. 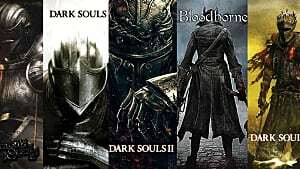 What's more, each weapon is a unique and welcome addition to Dark Souls 3. We now have a strength greatbow, an HP regeneration shield, a torch that blows fire, and a lighting quick gladius paired with a shield -- among many others. 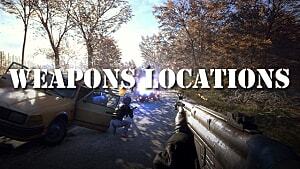 All new weapons are displayed in the order you might naturally discover them within the DLC. Cautious readers should note that there are indeed spoilers ahead. The Follower Javelin is a sweet new spear weapon that you've likely already seen in action by the Farron Follower mobs roaming the snowfields. The weapon art tosses a javelin at your foes, impacting much like a Great Arrow. It scales best with strength, though. 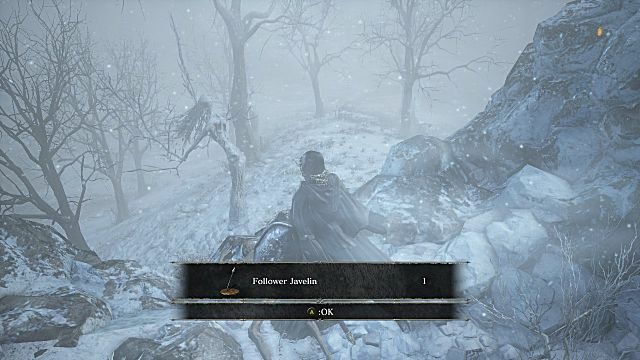 You can see the Follower Javelin on the edge of a cliff near the Snowfield bonfire. To reach it, simply wrap around the right cliff face. The snow will give out and you'll take a spill not far from the bonfire. Don't panic, you're on the right track. Keep following the right wall, taking out any wolves that come your way. Eventually, you'll come upon a narrow pass lined with aggressive trees. At the end there's a band of 4 or 5 followers guarding the Follower Javelin. Take them out and claim your reward. The Millwood Greatbow is much like any other greatbow, except it scales best with strength. It even comes with a unique weapon art that creates a mini earthquake on impact. You'll stumble upon the Millwood Greatbow in a side area near a tower with Millwood archers. Contrary to what you might think, the greatbow is one of the few Millwood weapons not found in the tower. From the Snowfield bonfire, follow the right cliff face again until you fall. This time, head towards down the slope and to the left. Fight off the giant wolf if you haven't already and follow the pass until you sight the Millwood tower. Follow the cliff face left and you'll find a side area with a few aggressive trees and a couple of grounded Millwood archers. 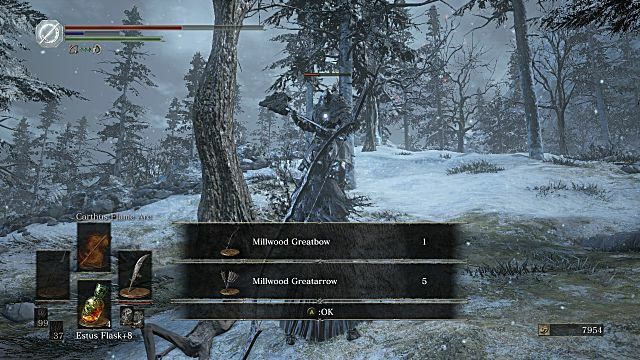 The Millwood Greatbow is found at the archer's feet. Be careful taking them out; the Millwood are a formidable threat. 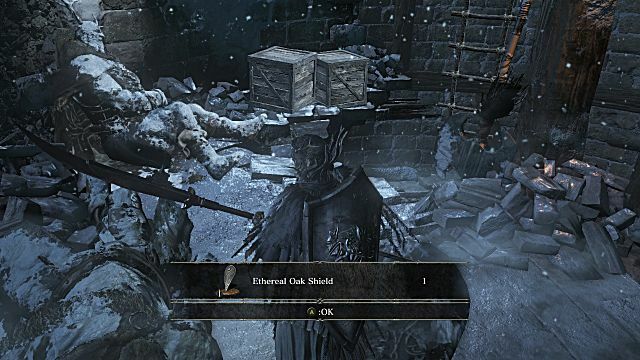 The Ethereal Oak Shield is a nifty, new 100% Physical guard absorption shield that slowly regenerates your health over time. The best part is, it only takes 12 strength to wield. However, it's a Weapon Art shield, so there are no parries or bashes to be had. It's found on a corpse within the Millwood tower mentioned in the Millwood Greatbow section. From the Snowfield bonfire, follow along the right cliff face until the snow gives out below you. Head down the slope and hang a left under the pass. Rounding the corner you'll see the Millwood tower in the distance. When you don't have to fight the Millwood, I find it's better to run past them. B-line it for the tower and run up the stairs. You'll see the Ethereal Oak Shield while climbing the ladder here. 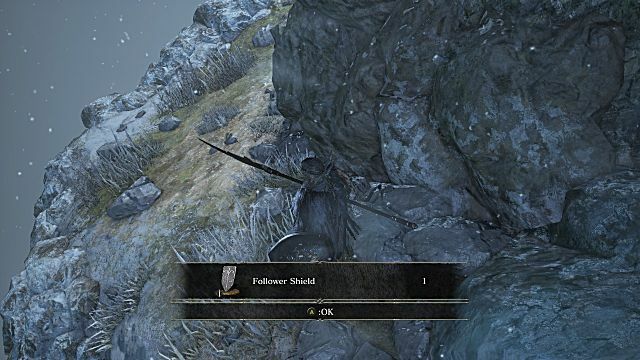 Deal with the Millwood archer by pushing him out the crack in the wall and head down the stairs to claim your new shield. The Millwood Battle Axe is like any other axe weapon in the game. It scales best with strength and has the regular Warcry weapon art. 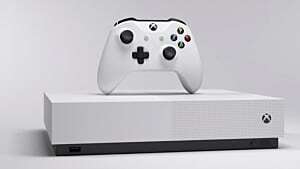 However, instead of standing still and screaming like a normal Warcry, you leap forward aggressively before staggering opponents with your mighty roar. Similar to the Ethereal Oak Shield, the Millwood Battle Axe is found in the Millwood tower. From the Snowfield bonfire, follow along the right cliff face until the snow gives out beneath you. Head down to the edge of the slope and veer left under the pass. Run past the Millwood in the field and head straight into the tower. Climb the ladder and head up the stairs to the top floor. 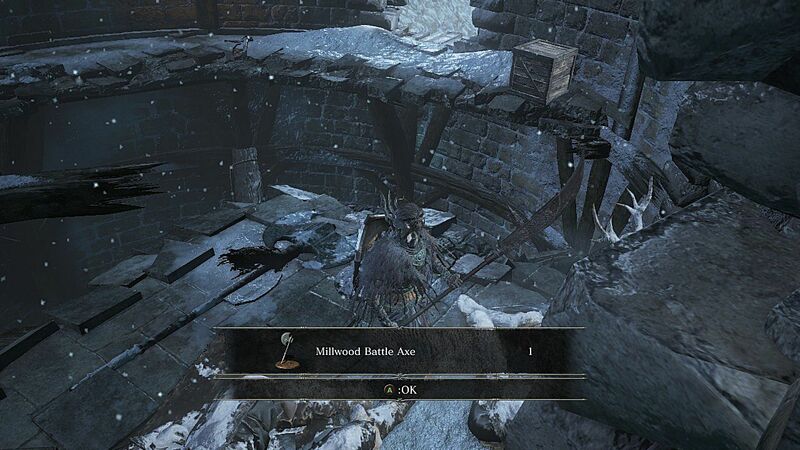 You'll see the Millwood Battle Axe on a landing that you can't quite reach by jumping. You'll have to drop down to it. Head out through the doorway and up the ladder on the right. Carefully make your way along the rafters. Drop down to the set of rafters below for a better vantage point before landing at your destination. You've likely already seen this weapon in use by the Farron Followers already. It's a quality (strength and dexterity) sabre with a natural kick and a shield-breaking weapon art. It is located on the roots leading down to the Depths of the Painting bonfire. It's actually easier to reach it from the bottom. From the bonfire, head up the root and drop down on the Millwood archer. 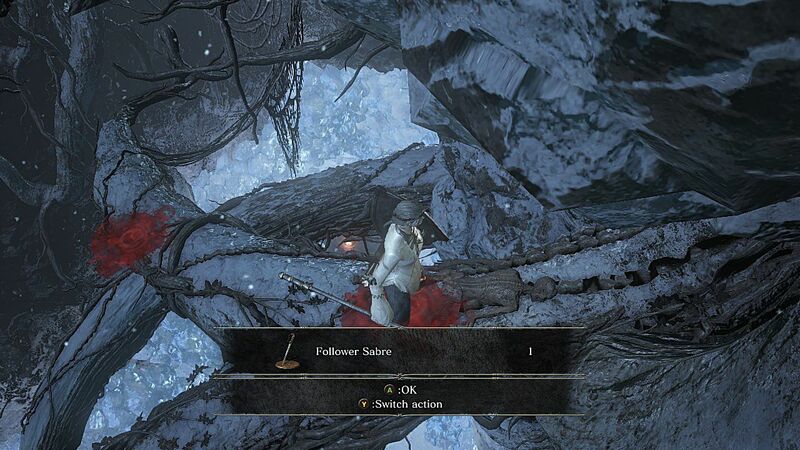 You can see the Follower Sabre from here, on a thin root above the torch-wielding follower. Simply head on up the thick root you're standing on and drop down to reach it. Valorheart is a quick gladius paired with a shield. Instead of two-handing the gladius, you'll pull out a special shield that you can perform unique attacks with. If you're a fan of the sword and board, you have to try out this new weapon. Thankfully, it's fairly hard to miss. To get it, you need to defeat the Champion's Gravetender and the Gravetender Greatwolf. This boss doesn't drop a twisted soul for Ludleth to transpose, but you'll receive Valorheart alongside the Champion's Bones on death. To find this boss, head across the long, rope bridge from the Rope Bridge Cave bonfire and give it a good whack, a la Catacombs of Carthus. Slide down the newly-created bridge-ladder and make your way down the roots to the bottom of the icy cavern. From the Depths of the Painting bonfire, follow the right wall until you stumble upon a ledge. Drop down to access the boss arena and begin your fight with the Champion's Gravetender. The Crow Quills can be seen on a sort of island among the blood-soaked rivers of the Corvian Settlement. It's a rapier weapon paired with 4 quill darts that you can throw at opponents. It can be seen on an island in the middle of the river of blood as your approach the Corvian Settlement. From the Corvian Settlement bonfire, head across the bridge and make a sharp left around the house here. Run across another bridge and roll onto the ledge to the left. Hang a right into the building and break the barrels on the landing. You should see the Crow Quills on the island below you. Take a running jump and claim your prize. The Crow Talons is new claw weapon that scales with dexterity. The moveset is largely the same as any claw weapon, but the Weapon Art is a leaping slash followed by a flurry of attacks meant to stunlock your opponents. It's found on the rooftop of the first building you passed through in the Corvian Settlement. From the bonfire, head across the bridge and up the slope. Duck right between two building and hug the wall, ever wary of enemies who hope to push you off the ledge to your demise. Round the corner and climb the ladder onto the rooftops of the Corvian Settlement. You can spot the Crow Talons on the rooftop behind you. Drop onto the bridge next to the ladder you just climbed and head into the building you were standing on to open up the shortcut. Head back out and cross the bridge. Round the side of the build, taking the high ground and walk onto the roof from the wooden ramp. Take out the two spell-casters and pick up your Crow Talons. The Onyx Blade is a greatsword that scales best with intelligence and faith. The Weapon Art is a built in buff that imbues the sword with Dark power. Otherwise it's got a pretty standard moveset. You will find the Onyx Blade naturally by making your way to the main boss of Ashes of Ariandel. You get it by killing the NPC that attacks you in the building at the end of the Corvian Settlement. To reach the building, head on top of the roofs of the Corvian Settlement and make your way across to the courtyard. Open up the gate as a shortcut and head inside the building on the right. The character that attacks you is rather strong and utilizes heal spells, so try to be quick about taking him out. You don't want to get into a prolonged fight with him. The Follow Shield isn't very impressive overall. It only has 80 Physical guard absorption, though it has a decent Dark block rate sitting at 65. Like the Ethereal Oak Shield, it's also a Weapon Art shield so no parries or bashes. It's found in the Snowy Mountain Pass, a maze-like area hiding hoards of Farron Followers along with a sprinkle of wolves and Millwoods. From the bonfire, head up the slope and hang a right towards the bell. Just before the bell, veer left and make your way towards the cliff's edge to pick up the Follow Shield hidden in the narrow pass to the left. The Earth Seeker is a new greataxe with a pretty standard moveset. It requires 15 faith to wield properly thanks to its unique Weapon Art. Activating it taps the axe on the ground, spawning earth tremors in a huge AoE around you. It's hidden down a ditch in the Snowy Mountain Pass. From the bonfire, head up the slope and veer right towards the bell. Pass the bell and continue heading straight, up the slope. Follow it to the end and the snow will give out beneath your feet, dropping you into the ditch. There are 3 Millwood here. 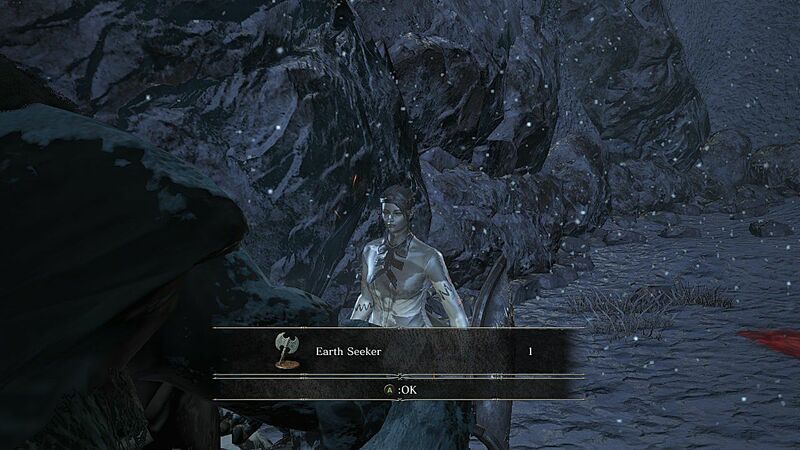 Earth Seeker is hidden in the cave behind the Millwood wielding the weapon. Run past him and nab it for yourself. It's time to breath fire! The Follower Torch is a new torch weapon (of all things). It has a Weapon Art that allows the user to breath fire. You've likely been crisped by this hot, new move already from torch-wielding Farron Followers. Instead of dropping it, you'll have to take a hike and find it hidden in the Snow Mountain Pass. From the bonfire, head up the slope and head right towards the bell. Take another right just beyond the bell. You should come upon an artificial slope through a small passageway. Head up the sloped road and deal with the wolves at the top. Instead of going right here, take a left down the narrow mountain path. 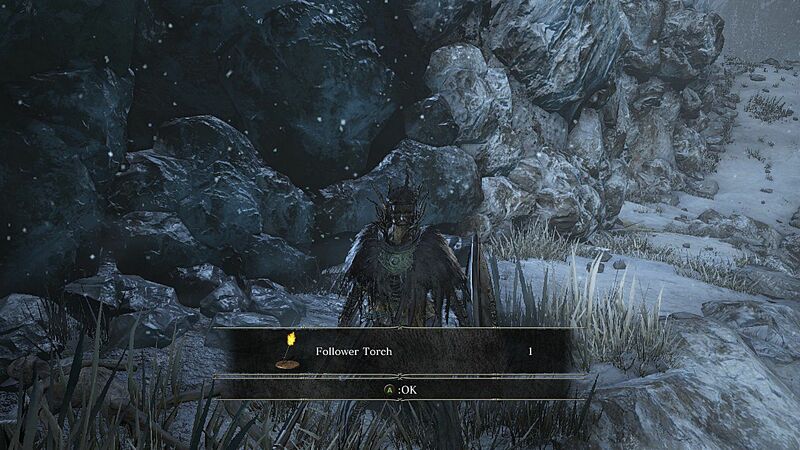 At the end you'll discover the Follower Torch. The Quakestone Hammer is a favored weapon of Millwoods. It scales with strength, and has your normal great hammer move-set, but a unique Weapon Art. The hammer burrows itself into the ground in one mighty smash, and heaves chunks of the earth out in a mighty AoE (Area of Effect) attack. This weapon is hidden in the Snowy Mountain Pass. From the bonfire, head up the slope and right past the bell. Hang right and head up the artificial mountain pass. Kill the wolves and hang a right. Ignore the Millwood archer and his friend to the left, and follow the left edge up into a narrow pass. 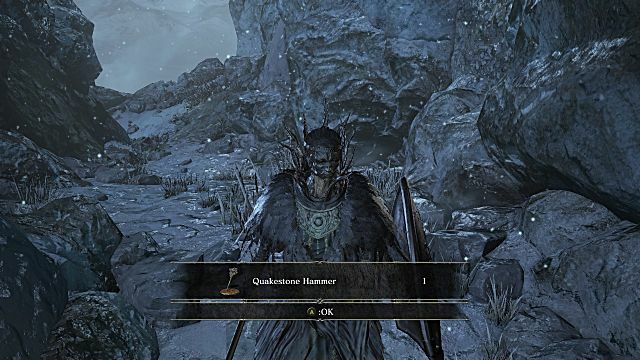 There's a hammer-wielding Millwood is fittingly guarding the Quakestone Hammer at the end of the pass. Defeat him and claim your reward. The Pyromancer's Parting Flame is a new catalyst for casting pyromancies. It's got higher base damage than the Pyromancy Flame and requires 15 strength to wield. The lower scaling in intelligence and faith suggests it's better for builds who don't level the stats very far. 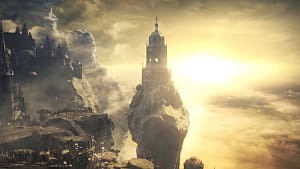 It's located on top of the tower where you found the Champion's Gravetender, but don't expect to find a way up from the boss room. You won't be able to reach it until you have access to the final boss. 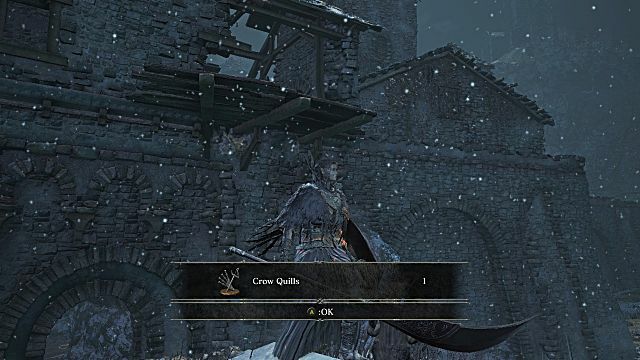 It's quicker from the Ariandel Chapel bonfire, but if you haven't unlocked the shortcut yet, you'll have to head from Snowy Mountain Pass. From the Snowy Mountain Pass bonfire, head up the slope and past the bell. Head right and go up the artificial slope, killing the wolves. Follow the path along past the Millwood archer and his battle axe friend, into the building filled with the bleeding blowflies. The left wall at the far end of the room is illusory, hiding a staircase down to the lower level. (You could, of course, just jump.) On the bottom level, whack the 5th wall on the right. It's doorway pattern being lower on the wall clues you into the illusion. Sprint down the wall and carefully drop down the tree roots to the tower below. 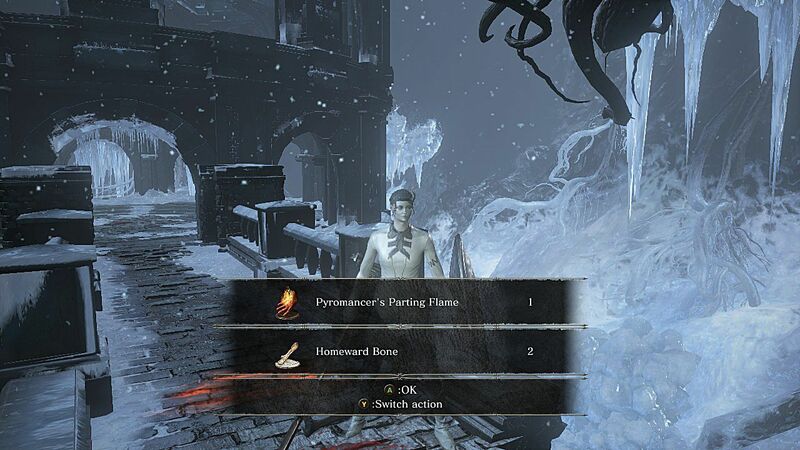 Loot the corpse to claim the Pyromancer's Parting Flame. 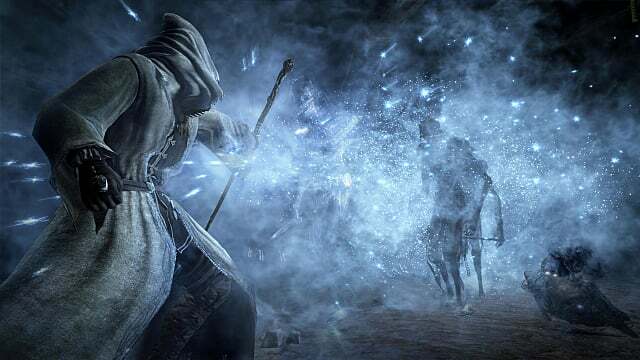 Friede's Great Scythe is a new magic and frost-imbued scythe with a shorter, paired scythe for her Weapon Art stance. It scales well with both dexterity and intelligence. The Rose of Ariandel, on the other hand, is a new whip class weapon that scales well with Strength and Faith. It bleeds opponents and the Weapon Art is a self-damaging attack that buffs your miracles. The low strength requirement allows any miracle user to utilize this nifty new buff. These weapons are both transposed from the soul of Sister Friede, the final boss of the Ashes of Ariandel DLC. To access the boss, you must crank the wheel at the bottom of the pit in the room filled with blood flies. Ashes of Ariandel introduced 5 new armor sets and 1 new ring. While the ring probably should have made it into the base game, the five new armors are welcome additions to Fashion Sou-- I mean Dark Souls 3. 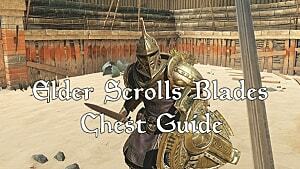 The Follower set is the most straightforward armor set to find in the DLC. 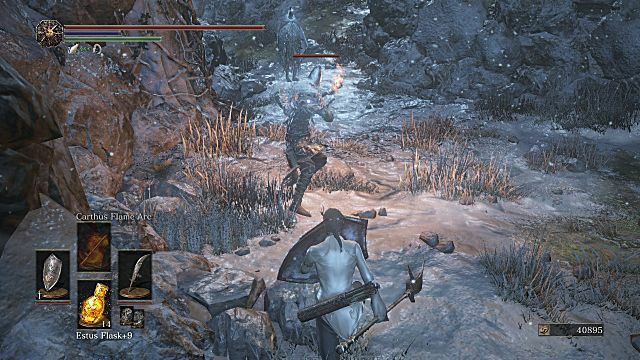 The Farron Follower mobs randomly drop all four pieces of the set on death. Just farm them near the Snowfield or Snowy Mountain Pass bonfires. The Millwood armor set can be bought from the Shrine Handmaid after giving her the Captain's Ashes found atop the Millwood tower. From the Snowfield bonfire, follow the right cliff face until the snow gives out beneath you. Follow the slope downhill and veer left under the pass. B-line it for the tower on the other side of the field and climb the ladder to the top. Head up the stairs, outside to the balcony, and up the next ladder to the rafters. 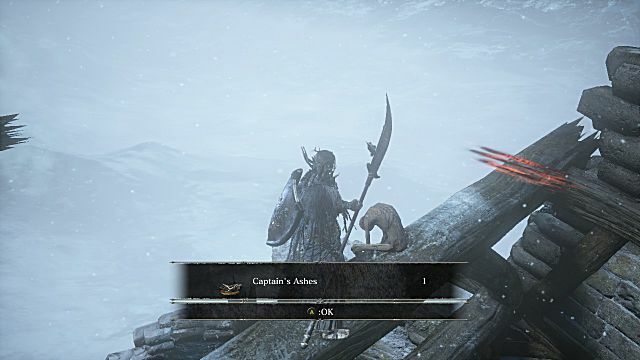 The Captains Ashes are found on a corpse at the highest point of the tower. The Chillbite Ring was suspiciously missing in Dark Souls 3. 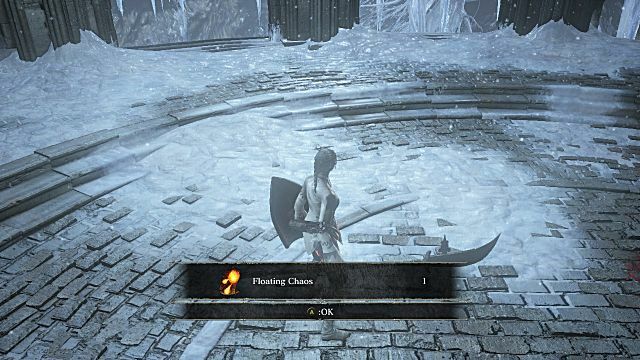 Every other resistance was already covered, and frost resistance is included in Fleshbite Rings, but Chillbite itself was nowhere to be seen. Oh well, it's here now. 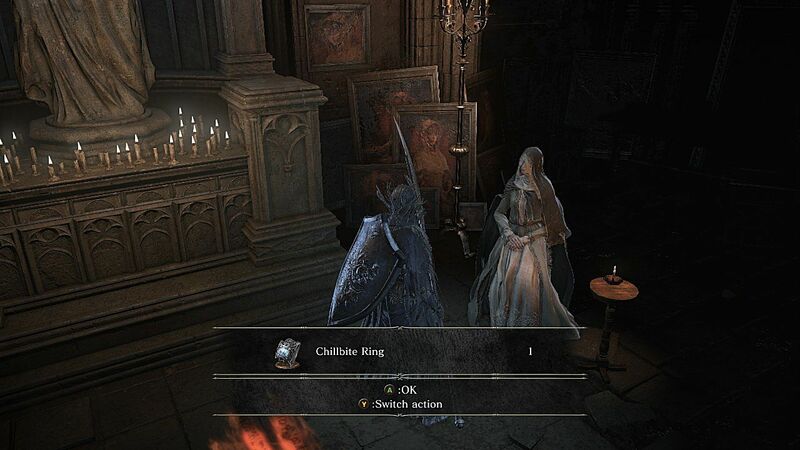 You'll receive it from the woman in Ariandel Chapel after speaking with her a few times. 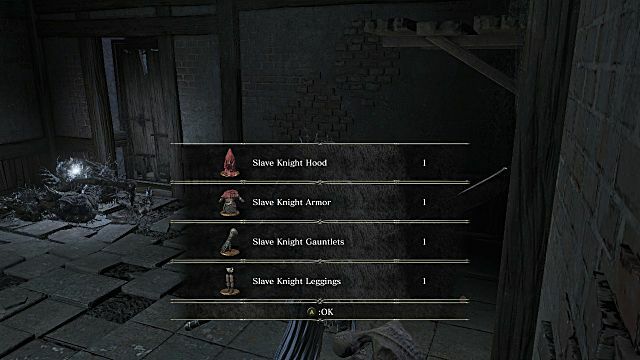 The Slave Knight armor set is found on a corpse within one of the houses of the Corvian Settlement. From the bonfire, cross the bridge and run up the slope until the monster wielding the Crow Quills jumps out at you. Duck right between a couple houses and round the corner to come face to face with a toxic-spewing corvian. Head up the ladder and onto the rooftops here. Follow the roof until you come to a tower with a ladder inside. Instead of climbing the ladder, drop down the hole and prepare for a fight. The Slave Knight armor set is found on a corpse in this room. Vilhelm's armor set is the same one you see the Onyx Blade wielder wearing. This is easily my new favorite knight-in-shining armor set. 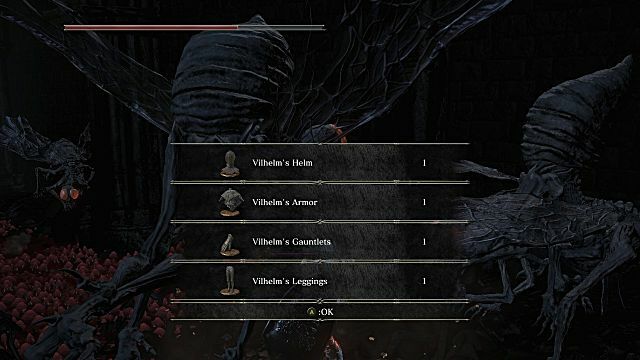 It's found in the room full of blood flies under Ariandel Chapel. From the Snowy Mountain Pass bonfire, go up the path and head right, past the bell. Turn right and head up the artificial slope. Kill the wolves and continue on past the Millwood archer and his battle-axe-wielding friend. Run into the room filled with blood flies and continue on to the end. The last wall on the left hides a staircase. Whack it and head down to the bottom floor. (Jumping is always an option.) In the back right corner you'll find a corpse with Vilhelm's armor set. Once again, you're looking at defeating a boss to get this equipment. The Ordained Dress set is a 3 piece set that's purchasable from the Shrine Handmaid after defeating the main boss of Ashes of Ariandel. 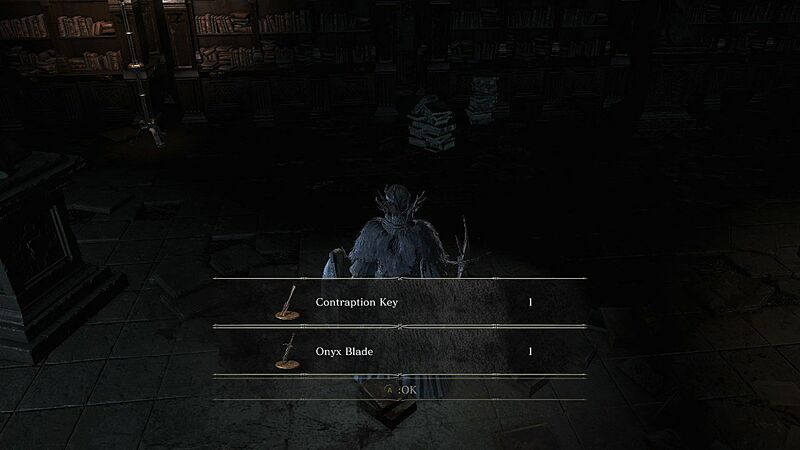 To access the main boss, you must crank the wheel found in the basement of the blood fly room below Ariandel Chapel. 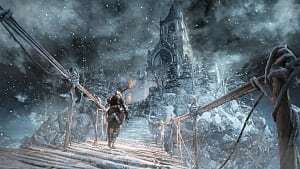 Ashes of Ariandel only introduced 4 new spells, but each new sorcery, miracle, and pyromancy is unique and worth checking out. 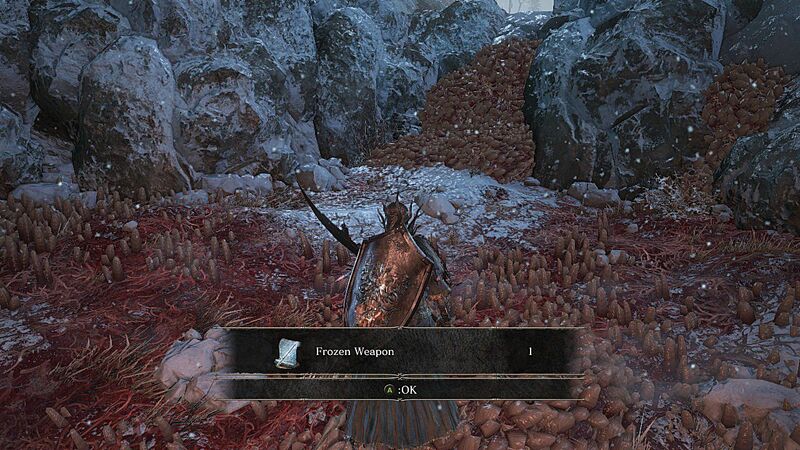 Frozen Weapon is a new weapon buff sorcery that applies frost damage to your attacks. 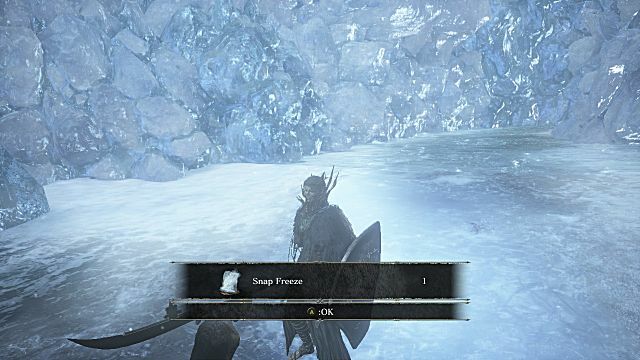 A new debuff in Dark Souls 3, frostbite has been largely under-utilized in weapons and magic. With the low 15 intelligence requirement, this new spell may single-handedly turn the tables. From the Snowfield bonfire, hug the right cliff face until the snow gives out from under you. Take a sharp left up the hill with aggressive trees and wolves. There's a short, bloody stretch trench just down the hill on the other side. Kill the blood flies and claim the Frozen Weapon sorcery from the corpse in the middle. Snap Freeze is a new sorcery that behaves much like Pestilent Mercury. Casting it creates a cloud of frost that builds up frostbite on enemies who walk through it. From the Depths of the Painting bonfire, head left past the giant crabs and follow the path all the way to the end. You'll stumble across the one aggressive that can actually move. It's guarding the Snap Freeze sorcery. It's much too dangerous to run in there and snag it, so be sure to take out the tree first. 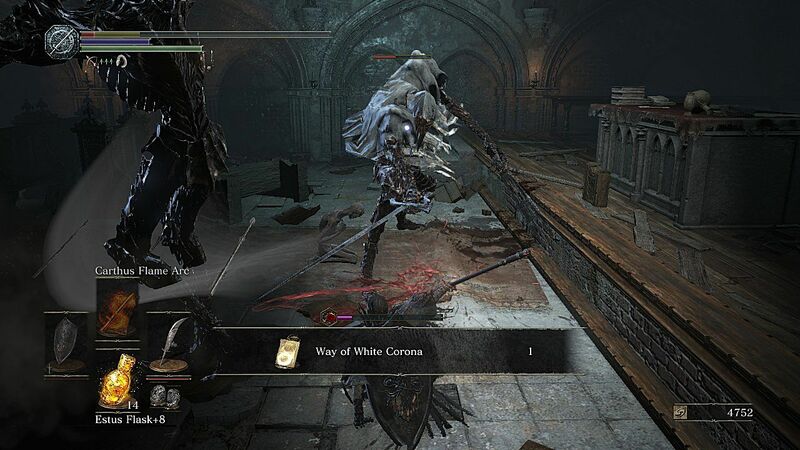 The Way of White Corona is a new offensive mirical for Dark Souls 3. It shoots out a disk of light, which then lingers in spot after a certain distance before returning to the caster like a boomerang. This spell has really great mind-game potential in PvP. It's located in a chapel in the Corvian Settlement. From the bonfire, head across the bridge and up the hill towards the courtyard. Head through the shortcut gate (if you haven't unlocked it, duck to the right between a few buildings and make your way across the roof tops). Enter the chapel to the left and deal with the crow monsters found inside. The corpse holding Way of White Corona is at the other end of the building in front of the altar. 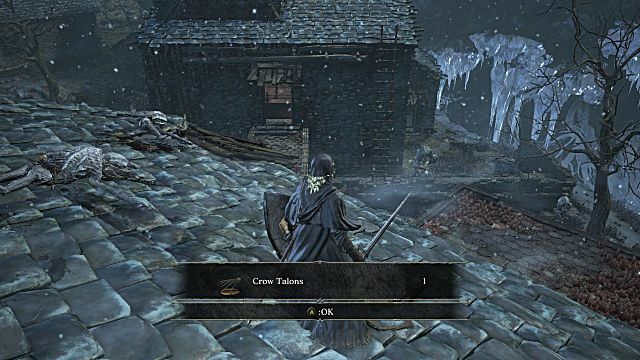 If you find the crow enemies as difficult as I do, you may want to jump down from the window in the roof to get near the item. There's a ladder on the right side of the building. The Floating Chaos spell summons a floating ball of fire that fires a barrage of 3 fireballs at your enemies automatically after a short delay. It activates about as quickly as Homing Soulmass. Head down the hidden staircase (or just drop), and whack the 5th wall on the right, revealing the illusion. Run down the hall and carefully drop down the tree roots to reach the tower. Ember up and prepare for a fight. And that's how to find everything new in the Ashes of Ariandel DLC. 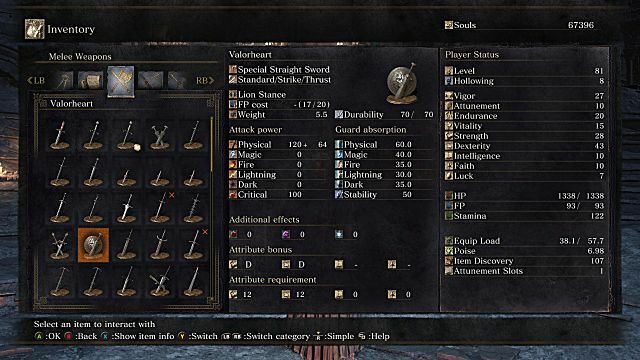 What's your favorite new weapon, spell, or armor set in Dark Souls 3's first DLC? Join the discussion in the comments below!